The BMW M6 combines performance and looks for a sweet ride. 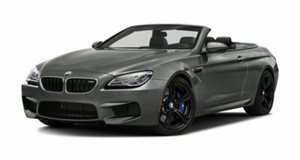 We haven&apos;t seen the BMW M6 Convertible since it made its world debut at the 2012 New York Auto Show back in April. The open-top version of the M6 is powered by an impressive 4.4-liter turbocharged V8 that is gazumped only by its sheer good looks. BimmerFile attended the press launch of the 2013 M6 Convertible, held in central California, and picked up a huge gallery of photos to go along with a terrific video showing the convertible handling the racetrack. The Bimmer&apos;s entire 560hp and 500 lb-ft of torque are on display in the clip below, as the new model can sprint to 62mph from rest in 4.3 seconds and can reach 124mph in 13.1 seconds. It tops out at 155mph. Check out the new BMW M6 Converitble as it shreds the track and enjoy it relaxing in the Californian countryside in the gallery below.